ORGANISERS OF THE Rally for Life, due to take place in Dublin today, say they are expecting a “huge turnout” with demonstrators gathering to demand a referendum on the Protection of Life During Pregnancy Bill. Entrepreneur and political activist Declan Ganley will join other speakers in asking the Taoiseach Enda Kenny to put the bill to the people in a referendum. 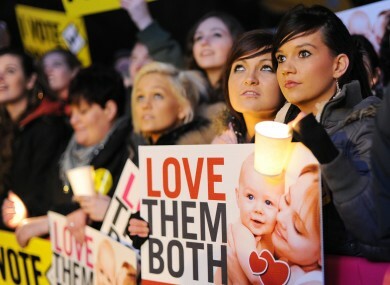 The protest has been organised by the Rally for Life Committee, which includes organisations such as the Life Institute, Precious Life, Youth Defence and other pro-life groups. Uí Bhriain added that many Fine Gael TDs were being “bullied” into supporting the legislation becaus of the whip system. “This is not just about abortion, it’s about democracy and letting the people decide on this hugely important issue,” she said. The rally is due to leave Parnell Square for Leinster House at 2pm. Ahead of the protest, Archbishops Diarmuid Martin and Eamon Martin will celebrate Mass in St Savior’s Church, Dominick St at 12.30pm. Email “'Rally for Life' protest to call for referendum on abortion bill”. Feedback on “'Rally for Life' protest to call for referendum on abortion bill”.